As I finished this semester university exams, I've retaken some tech books I had halfway read and finish the task. 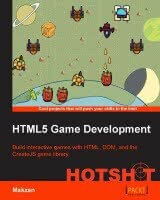 First one is done, a 360 page book about game development using HTML5 and CreateJS. The first and last chapter use CSS and HTML, but the remaining ones make use of the sub-libraries of CreateJS to teach how to manage game loops, even-based logic, sprite and vector-based graphics, collisions, screen coordinates, Box2D physics, levels, saving and loading data (using LocalStorage), and mobile-friendly UIs that adapt game menus to both big and small, landscape and portait screens.